“My name is Lesley Wade, I’m a Lecturer in the School of Nursing at Manchester University. My grandparents were Mr and Mrs Tilsley: they lived at 99 Ridge Hill Lane and had lived there since approximately 1923. They lived with my granddad’s father Ellis Tilsley and Ellis and Leonard were notable Aldermen of Stalybridge and ultimately my grandfather became Mayor of Stalybridge in 1956. I spent many evenings and many holidays with these two charming people and of course in doing so they did reflect about the house they lived in, the nice new Hague estate and the people they’d met and the sort of conditions of Ridge Hill and they looked at it with optimism. He was a noted Socialist Councillor and that was part of his philosophy as a very young man. My grandmother was a Manx woman, she came from quite a big farm had a very tragic life because her mother died when she was 13: she brought up 5 children. Leonard went to Coneyman’s Camp on the island, on holiday, and they were introduced by her cousin as they walked along the prom in Douglas. 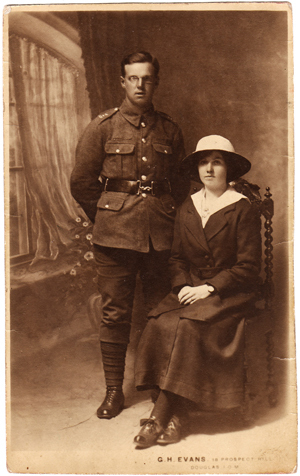 He went to the First World War and they wrote beautiful letters to each other for at least 6 or 7 years, and the first thing he did when he came out away from Cyprus was to get a new pair of clothes, go with Ellis Tilsley’s father and go and marry Gertie Kennaugh. My grandparents were very much average working class people who were Socialists and they insisted about education, education, education: so that my grandmother had insisted, unusually for that time, that her daughter would also get, if she wished, to go to the grammar school. If she was able, they would make sure she went, so they sacrificed a great deal for both of them. There was nothing in the house of real value except books, I remember that even in 1962, 63, but everything was valued regarding education so of course my mother had done very well at what was called the Nursing School then, and she’d said she was determined she wasn’t going to give up her profession. She became the Assistant Director of Nurse Education at Ashton-under-Lyne Hospital. I remember I was even then able to distinguish that my parents’ house in Denton was quite a modern house with all relatively modern amenities but my grandparents’ house had stayed as though the Second World War had just not even finished. There was little money in the house because my grandfather was a committed Socialist, he was a grocer and he had quite a few shops in Stalybridge. Castle Hall was one of his first shops and ultimately he had the grocers shop in Hanover Street and then in Melbourne Street as well, so he was well known in Stalybridge and he was the manager of the Co-op in that part of Stalybridge. Everybody in Stalybridge knew them that was quite amazing. Just one reflection is that if we had to go in to town, which we did every Thursday and Friday, you had to dress up. I used to polish my granddad’s boots and I loved it because I loved them but Rosie and I (that’s my sister) used to raise our eyebrows because they wouldn’t have got outside the door without people coming to talk to us and ask Leonard about problems, what could we do, could we help them and it was like a procession into Stalybridge. He’d be very nice and directing people, and he’d retired by then, but we’d always end up in the Stalybridge Reporter office. I don’t know why, we always did that and with one of the chief reporters and I think he’d sometimes ask Leonard what he thought about different things. It was great for me because I’d be sitting there as a young girl about 6 or 7 or 8 but it was quite a learning experience I suppose. Leonard was quite left wing and had said after the First World War he had contemplated going into the Communist Party and then he thought he’d go into the Salvation Army, he was very annoyed and disturbed by things he’d seen. He wasn’t in France he was in Palestine and Basra but he was very annoyed at the class differences. I’ve just read his war record and amusingly it says something like ‘memory very intelligent, writing very intelligent’ and at the bottom it says ‘very intelligent for a working class man’. It was signed by this Lieutenant; whoever was his Officer – he said he actually got on very well with his Officer. The reason was because the troops that were sent to Palestine obviously thought, at the Armistice, that they were going to go home in 1918. As they got on the boat, the boat went left not right. Leonard, who was probably a spokesperson politely asked his Officer excuse me sir why we’ve turned the wrong way, he said ‘because you my boy are going to Cyprus’. He said ‘the new treaty has changed and we’re occupying Cyprus for 2 years’. They got to Cyprus and there’s two things about Cyprus, Grandfather said it was absolutely beautiful and for a boy from Stalybridge in the north of England to be taken to a Greek island like that, if you had some imagination, it was great. But after 2 years they got a bit annoyed and one day they rebelled and they threw their arms down: I only realised that you could do this after I watched ‘The Monocled Mutineer’. They went out on parade and they just put their arms down and said ‘we’re not continuing’. Leonard thought ‘God we’ve really done it now’, I think there were 3 men, Leonard was one of them, and the Officer in charge took them into the office and he listened to them, and he said ‘why did you do that’. Leonard said ‘well we’ve been here 2 years we want to go home and we want to marry our sweethearts’ and the Officer said ‘indeed and so do I so we’ll say nothing of this matter’. So he was lucky. If you asked me was my grandmother Socialist, I’d say no she was Liberal, but I also suspect that my grandmother was very keenly an early feminist. She was a Manx woman and as you know the Isle of Man had given the vote to females in 1867. She was an educated woman: my grandmother was the real educator, tremendous reader, very quiet lady and she didn’t socialise outside the house except as the Mayoress. She really kept herself to herself, but she used to make some key points to me. ‘Never forget, never forget Churchill wouldn’t give us the vote, he promised he’d give us the vote and he didn’t and it was only until 1928 that people of England could vote’ she says and that was the most shocking thing when she came to Lancashire, was the fact that she felt really annoyed that she couldn’t vote. They were very much within a working class culture: the free libraries, Stalybridge Library, was the big boon to them – they used to use the library an awful lot. They were stalwarts of the community: to some extent it was a hard act to follow, and I suppose as my mother said, particularly Gertie was quite Victorian in a way but now reflecting on it I’d say Victorian in a good sense. Of course she was very strict but in the sense that there was an expectation of what you did and you just did not misbehave in any way your voice was never raised, there was never any swearing ever in the house and it was a very genteel atmosphere to be brought up in. I felt I was growing up in a household where you could ask questions. Every evening in 99 in the parlour, Leonard would have these grey envelopes and they were always from Stalybridge Town Hall and Chester, because he used to go to Chester a lot (that was the centre of administration for Stalybridge) and he’d be working till 11 at night on the papers, never paid for anything but worked till eleven at night, until he was about 70. My nan said that the new houses on Ridgehill were much better than the terraced houses lower down in Stalybridge and the Brushes estate. They were very optimistic about what socialism could do, but I’m not too sure that at the end of his life granddad was actually as optimistic, because he once sat down with me, bought me a book on the TUC, and said ‘we’ve gone all wrong Lesley, all gone wrong’. This story inspired me to write this song, which focusses on Leonard’s WW1 experiences. It’s sung to an adapted version of a Cheshire tune called ‘The Rambling Royal’. This tune also tells the story of a man who deserts (several times) rather than fight other people’s wars – notably, he refuses to go and fight in Ireland. Its roots are in an 18th Century Ballad called ‘The Bold Belfast Shoemaker’. It’s unusual in that it takes the side of a deserter rather than a recruited man, and also in that the soldier’s girlfriend encourages him to desert and shelters him, rather than encouraging him to join up. I’m grateful to my friend Roy Clinging (www.royclinging.com) for the use of his research. The allusion to Tipperary is there because the song ‘It’s A Long Way To Tipperary’, which became a soldiers’ song of WW1, was written by Stalybridge Music Hall Artist Jack Judge in 1912.